I’d really like to hear Sherrie Levine’s take on this one. Or Marcel Duchamp’s, for that matter. Everyone’s favourite poster-maker, Shepard Fairey, was responsible for one of the more enduring images from the 2008 election campaign – the Obama Hope poster, pictured at left. Fairey used a photograph taken by an Associated Press (AP) photographer, Manny Garcia, as the basis for his artwork. AP alleged copyright infringement. Fairey retorted: “Fair Use!”. That legal fracas is still to be resolved. But, ironically, it seems that Mr. Fairey may be surprisingly thin-skinned when other artists dare to appropriate his own work. 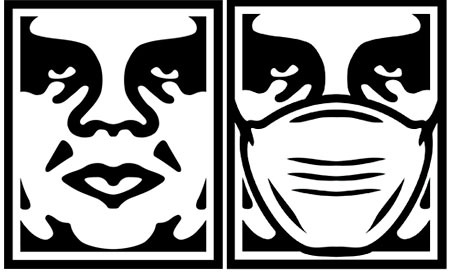 In April 2008, Fairey’s lawyers threatened an artist by the name of Baxter Orr with legal action after Orr appropriated one of Fairey’s best-known works, Obey Giant, embellishing Andre the Giant’s face (the subject of Fairey’s work) with a face mask and a new title: Protect Yourself. This isn’t the only case where Fairey seems to have been more inclined to dish it out than to cop it on the chin. According to Gawker, Fairey’s legal eagles landed a cease and desist letter on a Steelers fan in Pittsburgh who dared to sell little kewpie-doll Steeler mascots using the phrase “Obey Steeler Baby”. Fair use as an exception to copyright law exists for a reason. And a very good one at that. Without appropriation, whether informal or deliberate, a good swag of the art produced during the 20th century would have been illegal. And for a reason as mundane as trademark infringement. Appropriation in one form or another has been going on since our earliest ancestors began daubing on their cave walls. It seems highly inappropriate to mess with it.